A pre-Christmas appeal by Irish Tax Rebates. There are numerous private companies springing up advising that they can get you your tax refunds and advertising large amounts they have claimed back from Revenue for people. However I just wanted to highlight how simple it is to do this yourself, particularly for PAYE workers. Someone tagged the above item from ‘Irish Tax Rebates’ (one of those private companies) and I left a reply to a question from someone asking about medical expense tax refund/relief, on the thread. I told the person they could claim for the expenses online themselves using the Revenue Online Service – PAYE anytime. The response was promptly deleted. For PAYE workers, to claim back any over paid tax, you can request a P21 balancing statement, you can also submit your medical expenses yourself online. It’s literally a few clicks. This crowd claim that “LAST CALL to claim your 2011 rebate!! You have until 23rd December to get your form in or you lose the chance to claim for the tax year 2011.” It’s the 31st Dec with Revenue by the way. I haven’t requested one of their forms, but their form would entail giving them authority to deal with Revenue on your behalf. . Also, you’ll notice in the photo, the cheque issued is from Irish Tax Rebates. Any rebate cheque from Revenue is therefore being issued to that private company. Posted in Misc and tagged tax rebates at 1:47 pm on December 22, 2015 by Broadsheet. Yes, I did it myself via Revenue and got a Monkey back. Did my own return last year, €1,800 rebate!!! I’ve gotten a fair few amounts doing it myself too. Go to the docs and ask for a print out of your payments to them, same with the pharmacy, dentist, physiotherapy..whatever. Most places can do this very easily. For a PAYE worker also, a P21 is a balancing statement for the year and revenue will issue you a cheque, if you’ve overpaid anything. You can work out from your P60 if it’s worth your while requesting a P21. Anyway, it’s basically your gross, multiplied by 20% (up to 33, 800) anything earned over that amount @ 40%, add the two amounts together.. minus off your tax credits and that leaves you with your net tax. This is what you should have paid. You can check this against the total amount of tax on your P60 or final payslip. People seem to be waiting extended periods of time with those private companies dealing with revenue on their behalf. I’d be wary of them getting my money and them reissuing the cheque when they’re ready. Wondering also, do they deduct the fees for advertising for them with your own money? Are we now surprised that the world needs accountants? So what if people can save money by doing it themselves? Most people don’t have the time. Also there’s a healthy chunk of the population who just can’t, either from a fear of numbers or lack of literacy competence. There’s also the factor that people worry that if they claim for something incorrectly the Revenue will come after them for an audit years later. At least if the tax return was done by an accountant then people can sleep a little easier at night. I don’t see any allegation that this company is behaving either illegally or immorally by advertising their services. The deletion of a Facebook comment on their page indicates nothing more than common sense on their behalf. See what sort of response you’d get by going to a taxi firm’s Facebook page and pointing out people can save money by getting the bus. Also it’s figuratively a few clicks. Literally a few clicks would likely result in you offending some Bantu guy stuck behind you in the queue for the tax office. If you do, are YOU an accountant? I’d seriously doubt it. You’re a salesman. I’m not an accountant or a salesman. I don’t work for this company. All i am is a citizen who has seen first hand what a nightmare Revenue can be to deal with if they think you might owe them a few euros in tax. There’s a reason that fantastically wealthy and intelligent people hire accountants and solicitors to manage their tax affairs. Sure they could do it themselves, but they know that if something goes wrong it’s not worth the hassle. don’t have the time or competence?! I literally logged on to the PAYE site, couldn’t find the answer in 2 minutes, sent them a message asking how I could request a rebate on their contact page and got a reply back saying, “I’ve put in the request for you now”. I got a letter from Revenue a couple weeks later with a €400 rebate. If I’d done it through one of these places, I’d have had to pay about 12% commission fee for each year and spent at least an hour filling out their hideous forms. I don’t think they do tax returns. Self employed people submit tax returns. Accountants do submit tax returns on behalf of self-employed persons if hired to do so. This crowd only deal with PAYE workers by the looks of it.. not self employed. Tis very easy money for them in my opinion. Nothing against them or anything, but it’s very easy to get your taxes back yourself. Just on this bit too. They’re not a bunch of psychics like. They don’t know your medical expenses until you go and get them. You also have to provide P60s. That’s the hard bit done..
ROS – Paye anytime is very simple to use then. Revenue must have a demo of it somewhere… I’ll have a look. You have to hold onto medical receipts for 6 years, regardless of whether you submit for the relief on those expenses yourself or authorise one of these crowds to do it for you. A print out for the year from the practitioner/pharmacist whatever is fine. “offending some Bantu guy stuck behind you in the queue for the tax office”, what does that mean? I believe it’s a reference to click consonants, like the Xhosa have. Yeah… but it’s easy to work it out though beforehand. And, if you have massively underpaid, which is very rare -( they have hundreds of millions in overpaid taxes), you can come to an arrangement with them. So Phil you live in fear of Revenue? How are you with the local priest, cowering in the shadow of his cassock? Receiving medical expense tax refunds is very easy for the vast majority of people. Unless there’s a literacy issue, it’s an extremely easy process. You can do it the old fashioned way via paper but online is quicker and even easier. Revenue now have an app that lets you input each medical expense as it happens. Or stash all your medical receipts in a box, along with prescription claim forms (medicines can cost plenty!) and fill them in all at one go. You simply input the amount charged, the date and a reference of choice like “GP visit” etc and it calculates for you. Hey, it’s your € to claim. I just got a print out at the end of the year, for 4 years from everywhere I was entitled to claim the relief on.. Physio, doc, pharmacist etc…they advised they’d do as receipts. Was very easy to do online. Didn’t know they had an app to use as you go, that’s handy too. If you paid any money in the last 12 months to a doctor, dentist, etc. or had to buy anything required for your job (Tools, uniform, safety equipment, etc.) you will most likely get some tax refunded. And here’s a beauty, you can claim tax relief for bin charges paid in 2011, full tuition fees, rent paid (subject to some conditions), trade union membership. Note you can’t claim on regular dental work, the set of dental item is fairly small – look for the MED2 form, this also needs to be filled out / signed by the dentist carrying out the work. Fillings etc count as routine work and are not tax deductible. Yeah, the med 2 form that the dentist fills out, you keep this as a receipt and you can claim for your 20% back online, on PAYE anytime, rather than submit the form. Eh… not sure what that means.. but you’re wrong. It’s all there listed on the form there.. (which is a receipt, that the dentist should provide you with)…. You can claim back 20% on all the expensive stuff basically…. Provided you have teeth and provided you work. You can also claim tax relief for tools and clothing required for work not provided by your employer. Normal clothes (even suits that you’d never wear otherwise) don’t qualify for tax relief, only safety wear and uniforms. I know it’s better than nothing, but you won’t be splashing out on those flat rate expense allowances really. Say you work as an Airline Cabin Crew member and you get 64 euro allowance, (they mention that example).. it’s 20% of that, (or 40% max) of that 64, that you end up better off by. A whopping 12.80 or 25.60, depending on if you pay the higher tax. I think they increase your Standard cut off amount by the 64 euro. It’s not a tax credit. Yea, can’t imagine you’re going to beat PAYE Anytime. It’s a great service, can’t recommend it enough to people. Click click boom and your’e loaded, or at least that was my experience (I had worked on a rolling fixed term contract for 3 years and I had never had any tax credits applied, was compensated over €4000 and have since had an additional €1000 (inc €450 in the past few weeks) paid back for the same job after going back to University). It tells you exactly what you have and have not claimed and what you can claim. You should also request a P21 balancing statement from the revenue office for whatever years you are interested in. The only complaint I would have is they still use flash. You also should always keep an eye on your tax. While the revenue give you 7 years to catch any mistakes they make, if they find any that mean you owe money there is no limit to the amount of time they can ask for it back. Ha. Well it was your money. 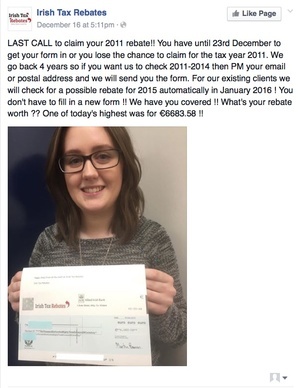 If only you had gone to some private tax refund company instead, you could have handed over about 500 of that , for the privilege of waiting weeks/months for your money and having your photo taken with their name on the cheque. You must have been lashed out of it on tax if you didn’t have any tax credits applied though. When you’re starting any job, you should get your employer registration number, call up the revenue and they’ll send out your Tax Credit Certificate to them, otherwise you’d probably end up on emergency tax. Yea, I think because it was a rolling fixed term contract they never bothered. I never even noticed it myself TBH. While it was of course “my money” and it would have been better to have it in a bank collecting interest rather than in the coffers of the state, it would have been spent if I had it, and it is now a welcome early christmas present for someone on a stipend. Well, it’s really up to you. You give them your employers registration number and they’ll send your employer out a tax credit certification, detailing your standard cut off and tax credits. That way you don’t get screwed. Was just reading a few things on that. I pay the 7% and am happy to. People often outsource tasks they are capable of carrying out themselves because they don’t have the time or inclination to do them. They make interest from the bank on the collected amounts too yeah? On that thread, some people say they are waiting a while for their money. They’ve gotten notification from revenue that such and such at the rebate company are dealing with their tax affairs, but a lot of people writing in the comments that they’re still waiting weeks and in some cases months for their money. The cheques are being made payable to that company, as people authorise that. If I were inclined to use this company, (which I wouldn’t as it’s so simple)… I’d go and ask revenue when MY refund cheque was issued to them and I’d be making a complaint to the ombudsman if there were any significant delays from when they reissued the cheque to me. Well that is easy. It has also revealed to me that the rent tax credit, for people renting property, has reduced from €1600 in 2011 to €800 last year, and €600 this year. I don’t suppose that might be affecting the whole homelessness situation for young employed families? Sorry, where are you getting those figures? It was never 1600. Shur the PAYE tax credit isn’t even that. Under 55 and single, it’s 80 squid this year. If you’re over 55, its 160. Sorry, those are next year’s figures. Actually a good question. I got the figures directly from my PAYE Anytime banking, and they were definitely there on my yearly reports. I’ll send a screenshot tonight when I get to my password and maybe you can clear it up for me, because I was confused myself!